Azerbaijan (/ˌæzərbaɪˈdʒɑːn/ ( listen) AZ-ər-by-JAHN; Azerbaijani: Азәрбајҹан / Azərbaycan), officially the Azerbaijan Soviet Socialist Republic (Azerbaijan SSR; Azerbaijani: Азәрбајҹан Совет Сосиалист Республикасы / Azərbaycan Sovet Sosialist Respublikası, Russian: Азербайджанская Советская Социалистическая Республика [АзССР], translit. Azerbaydzhanskaya Sovetskaya Sotsialisticheskaya Respublika [AzSSR]), also referred to as Soviet Azerbaijan, was one of the constituent republics of the Soviet Union between 1922 and 1991. Created on 28 April 1920 when Soviet Russia brought pro-Soviet figures to power in the region, the first two years of the Azerbaijani SSR were as an independent country until incorporation into the Transcausasian SFSR, along with the Armenian SSR and the Georgian SSR. In December 1922, the Transcaucasian SFSR became part of the newly established Soviet Union. The Constitution of Azerbaijan SSR was approved by the 9th Extraordinary All-Azerbaijani Congress of Soviets on 14 March 1937. On 5 February 1991, Azerbaijan SSR was renamed the Republic of Azerbaijan according to the Decision No.16-XII of Supreme Soviet of Azerbaijan approving the Decree of the President of Azerbaijan SSR dated 29 November 1990, remaining in the USSR for another period before its independence in October 1991. The Constitution of the Azerbaijan SSR ceased to exist in 1995, upon the adoption of the new Constitution of Azerbaijan. 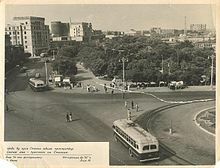 Baku in the early 1950s. Flag of Azerbaijan in 1991 before the collapse of the Soviet Union. On 28 April 1920, Temporary Revolutionary Committee took control over the country, and formed a government named Council of People's Commissars of Azerbaijan SSR. A parade on Lenin Square in Baku in honor of the 50th anniversary of the founding of Soviet Azerbaijan, October 1970. ^ "Decision of Supreme Soviet of Azerbaijan Republic (5 February 1991)" (PDF). Administrative Department of the President of Republic of Azerbaijan, Presidential Library (in Azerbaijani). p. 46. Retrieved 13 June 2017. ^ "Originally, Media Atropatene was the northern part of greater Media. To the north, it was separated from Armenia by the R. Araxes. To the east, it extended as far as the mountains along the Caspian Sea, and to the west as far as Lake Urmia (ancient Matiane Limne) and the mountains of present-day Kurdistan. The R. Amardos may have been the southern border." from Kroll, S.E. "Media Atropatene". 1994. in Talbert, J.A. Barrington Atlas of the Greek and Roman World: Map-by-map Directory. Princeton University Press, 2000. ^ Institute of History of the Azerbaijan National Academy of Sciences (1998). Azerbaijan Republic (1918-1920) (PDF) (in Azerbaijani). Baku: Elm Publishing House. pp. 295–300. ISBN 5-8066-0925-1. Retrieved 13 June 2017. ^ "Treaty of Friendship between Turkey, the Azerbaijan Socialist Soviet Republic, the Socialist Soviet Republic of Armenia and the Socialist Soviet Republic of Georgia on one hand and Turkey on the other, concluded with the participation of the Russian Socialist Federative Soviet Republic, in Kars on October 13th 1921" (PDF). Azerbaijan.az. Retrieved 13 June 2017. ^ "Nakhchivan: From ancient times until today". Presidential Library of Azerbaijan. Retrieved 13 June 2017. ^ Azerbaijan National Academy of Sciences (2008). Tahir Gaffarov (ed.). The history of Azerbaijan (1941-2002) in 7 volumes (PDF) (in Azerbaijani). 7. Baku: Elm. p. 229. ISBN 978-9952-448-48-1. ^ Suha Bolukbasi (2011). Azerbaijan: A Political History. I.B.Tauris & Co LTD. p. 164. ISBN 978-1-84885-620-2. ^ Zbigniew Brzezinski, Paige Sullivan (1997). Russia and the Commonwealth of Independent States: Documents, Data, and Analysis. M.E.Sharpe. p. 13. ISBN 1-56324-637-6. ^ "Milli Məclis". www.meclis.gov.az (in Azerbaijani). Retrieved 14 June 2017. ^ "Agriculture in the Black Sea Region". Archived from the original on 27 September 2013. Retrieved 24 September 2013.